Even though I was still more than a week away from arriving back in Chicago when I crossed the Eads Bridge over the Mississippi River from St. Louis to East St. Louis I felt a wave of joy, happy to be back in my home state despite the terribly depressed condition of my entry point. Entire blocks had been leveled and were nothing but weeds. Many of what buildings remained were boarded up. There was no traffic to speak of. Stop lights had long ago been turned off and were rusting relics, replaced by stop signs. It was a virtual dead zone, a stark contrast to the vitality and affluence on the other side of the river. Entering St. Louis from the north the road was littered with more stray coins than I had encountered the previous thousand miles. I even found a pair of gym shorts with a ten dollar bill in a pocket. I also gathered a bin of fishing lures and the greatest find of all, a Trump mask. No one had swerved to run over it, nor has anyone responded to it in any way since I attached it to my bike, just as my mini-Cubs W flag lashed to the back of my bike had been totally ignored all the way from Telluride. I had a fine eighteen-mile early morning ride out of St. Louis from its western suburbs, where I stayed with my ardent cycling friend Peter, an administrator for the two Principias, and visited with my old friends Robin and Ellwood and Chris. Ellwood and Chris were in particularly good spirits as the fund they manage (Towle) had just experienced its second "Trump Bump," gaining twenty per cent in the past month thanks to the President's proposed tax plan. Last November they enjoyed an even greater bump of fifty percent. That brought them so many new investors they had to temporarily put a cap on accepting them. My route through the burbs transitioned me into the city via it's superlative Forest Park, a true treasure full of museums and lakes and site of the 1904 World's Fair. I continued past the city's palatial downtown Carnegie Library, filling an entire block, and then by the spectacular Arch before crossing the Mississippi. Though my entry into the city the day before had been complicated with few choices for getting over the Missouri River, my ride out was a delight, especially since the first six miles had been with Peter and Chris and a friend of theirs who had twice biked coast-to-coast. They turned off to join up with several dozen other MAMILs that we saw amassing for their weekly 7:15 a.m. "Knucklehead Ride," a local ritual that'd been going on for thirty years. 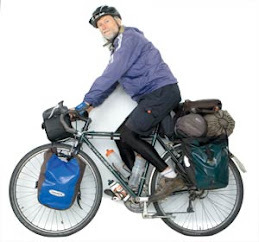 Peter wasn't going to ride long as he had a cycle cross race to get to over in Alton on the other side of the river. He'd be one of the favorites in his category, as he'd just entered the 60 to 64 age bracket. He's no slouch, as in years past he has qualified to compete in the national championships on the road and time trial. He has the sense to resist competing in crash-prone criteriums. He's well versed in all phases of training and racing, including nutrition. When I arrived at his home within walking distance of Principia, he had a deluxe smoothie for me and had nutrition-rich nibbles available too. In the beastly hot summer months he commences his training rides at 4:30 in the morning, so it was no big deal hitting the road at 6:30 with me, just as the sky was turning pink. It was a treat to talk cycling over dinner and into the night with someone who has put so much thought into it. He had even attended a racing camp in Asheville conducted by my friend Randy Warren and had gotten advice from one of Christian Vande Velde's most valued advisors--Dr. Allen Lim. Peter met him while scouting out the national time trial course a couple of years ago. He didn't recognize him at first and asked him as they were riding along how he could improve his aerodynamics without the huge expense of going into a wind tunnel. Lim said to just vary his position while riding in a very quiet area and find a position that minimized the sound of the air going by his ears. That brought to mind one of my all time great descents in the Andes while in I was in Bolivia after crossing a 15,000 foot pass. After twenty minutes or so flying down the mountain I began hearing what I presumed was the roar of a truck coming from behind me. The sound grew louder, but I held off the truck. When I peeked behind to see how close it was, there was nothing behind me. The sound I was hearing was that of the air thickening with oxygen. I was happy to learn that Peter wasn't weary of my ongoing Carnegie quest. Some might consider it an obsession, but Peter termed it a "beneficial appreciation." He thought "obsession" had a negative connotation, and he saw nothing negative about my pursuit and celebration of the libraries. Even though I've been to hundreds, I was excited about the string of them that awaited me in Illinois. However similar they may be, each has a distinct quality and radiates an unmistakable aura from generations of patrons who have loved it and spent countless hours of contentment within its confines. These masses have left an immeasurable residue of gratitude for the hours and hours of reading pleasure their library has provided them. I can feel it from miles away and I like to think I may contribute to the aura myself, cross-pollinating them as I hop from one to another and linger within their confines. My first Carnegie in Illinois came in Edwardsville twenty miles from East St. Louis following old Route 66. It took me past the Cahokia Mounds World Heritage Site. Though it was well beyond the decrepit perimeter of East St. Louis, there were dumpy mobile-home parks on either side of the park. I had climbed the mounds three years ago with Janina when we drove down to New Orleans visiting mounds all along the Mississippi, so I just let my gaze take them in, the largest Monks Mound to my left with its staircase to its summit and smaller mounds and the Park Headquarters on the other side of the highway. 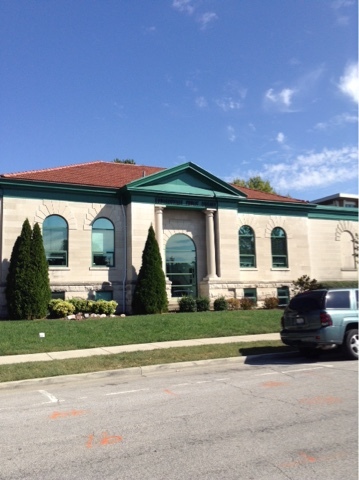 A cornerstone on the large Edwardsville Library said 1990. The librarian explained there had been a $2.4 million expansion that year that surrounded the original Carnegie to its left and right and its entire backside. The original entrance had been turned into a large curved window. The new much larger building was magnificent inside and out, but it was no longer the "perfect white diamond in a setting of emerald" as the town newspaper described the original library sitting in the town's park shortly after its opening. The article further gloated, "No city of the size of Edwardsville has a handsomer or better-equipped public library." The citizens of Litchfield thirty miles up Route 66 could easily dispute those claims as its unmolested Carnegie has only grown more noble with age. It has the town's central park all to its self, an honor more often reserved for County Courthouses or City Halls. 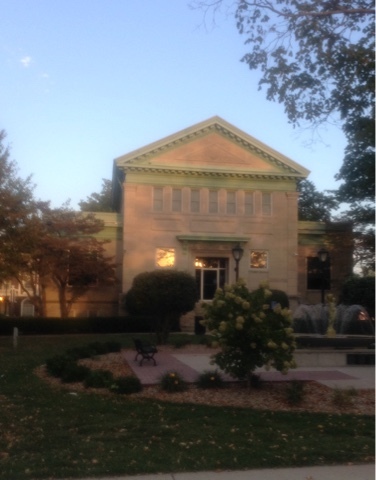 It's inscription of "Carnegie Library Litchfield" over its entry was particularly radiant in the setting sun. These initial two Carnegies whetted my appetite for the seven more that awaited me on my swath across the southern quarter of the state to Indiana. I knew a premium campsite awaited me either in the abundant forests or amongst the tall withered corn fields. 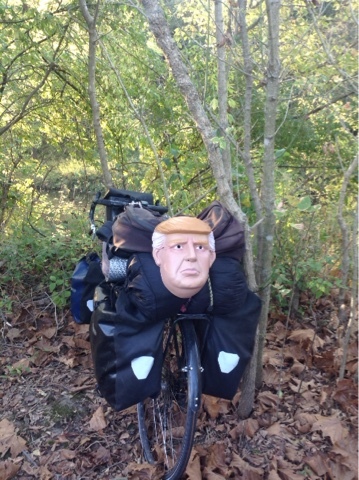 Perhaps you have been spared being run over for the Trump mask because it's slightly less obnoxious looking than the face of the real Trump.